The November release has been full of some gorgeous new products and we hope the projects from the team have been beyond inspiring! I've picked out favorites of my own, from each of the design team members, to share with you today! Click the link next to each team member's name to see more details about the project shown here, as well as the rest of her projects from this release! And be sure to read all the way to the bottom of the post…..you won't want to miss out on this month's release in review CONTEST!!! CLICK HERE to see more from Debbie Olson. 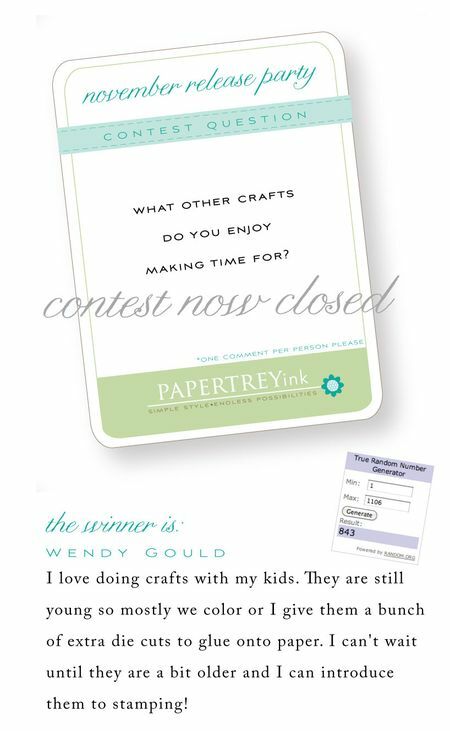 Congrats to Wendy Gould! Please be sure to email customer service with the email address you would like your gift certificate sent to. And thank you to EVERYONE for joining us all week long for the release festivities! Happy stamping. I also really like to make jewelry. It’s so relaxing and fun. i recently bought material to start quilling. I’ve always wanted to start doing that so hopefully I’ll find the time soon. Stamping is my main craft, but I found that I really like to paint little altered items. I also used to to cross stitch…your release is making me think that I should try it again some day! I like all crafts and enjoy learning new ones. I especially like to paint. I like to crochet!!! making an afghan during the cold winter months in Maine makes for a warm project!!! Rubber stamping is such a big part of my life that I don’t have time for much else, truth be told. But I do enjoy sewing when I have time, and also counted crosstitch. I enjoy some crocheting when I have time and would love to get back to my cross-stitching again (I have an unfinished project I started 5 years ago! )Brilliant release PTI! I scrapbook, sew, and knit also. And of corse I have other hobbies that tie into my crafts like photography. I also make jewelry, and recently I resumed embroidery. I have recently started to knit again. I had to make my husband a new pair of slippers and decided that I would look for a pattern to make myself something too. I never met a craft I didn’t like! I scarpbook, I knit, I even make my own glass beads (they are called Lampwork beads). I love crafting, it is what keeps me sane! I was born with the “bad athlete” gene; I can barely throw a ball. Crafts have always been my hobbies. Currently, I knit and make jewelery. As with cardmaking, creating something uselful and beautiful is so rewarding. At this time, papercrafting (cards, stamping, scrapbooking) are my main interests. In the past, I’ve done many crafts and revisit those sometimes (many kinds of needlework, crochet, knit, macrame, pencil sketching and drawing…and more). Some go along with papercrafting – like photography & quilling. I enjoy making time for sewing, which is a new craft for me. I’m starting to blend my love papercrafting with sewing and it’s definitely a lot of fun! Stamping and cardmaking is my obsession but if I had enough free time I would like to draw or decorate houses! When I’m not stamping (just when is that? LOL) I like to do some sewing….mainly quilting. Let’s see, I like to knit ( working on another one of those ruffle scarves), jewelry making, scrapbooking and I also love to go to Goodwill and find ‘treasures’ and refinish them in some way and add them to my home decor 🙂 Fabulous release this month as always. Scrapbooking and card making are my #1 hobby, but I also love to cook, crochet, make jewelry, and anything that catches my interest on Pinterest! I love to cross stich when I get the chance. Any type of craft really but card making is my love! In addition to stamping I also enjoy scrapbooking, gardening, baking and raising chickens! I have just discovered knitting! How excited was I to see this month’s release?!? Cardmaking is my love at the moment and consumes all of my spare time. I have made jewelry, crossstitched, appliqued,crocheted and knitted in the past. I have to say, cardmaking is my favorite, however. I love to crochet and knit. But only in winter. I quilt, scrapbook, needlefelt, and do mixed media art. I love to leave my stamping table to sit down to knit. I love all crafts but knitting and quilting are fun and relaxing. I also love to sew for my grandchildren. Stamping is the most fun and enjoyable. I learned to crochet from my Grandmother, and make time for it, along with counted cross stitch and a little (very little) knitting. I am signed up after the first of the year to take a beginning quilting class. I love to make gifts for my family & friends! Scrapbooking is my other craft though I must admit I’ve been doing it less because of card making and all the PTI goodies! The craft that I spend the most time working on, besides card making, is crocheting. And now that it’s getting a bit chilly outside, it’s time to start on some new hats! I really only do papercrafting but crocheting is on the bucketlist to learn. Beading or jewelry making, I just made my mother a birthstone rosary for her birthday. She said it is one of her most treasured possessions. I am so glad it means so much to her. Ya for release day! Thanks for all your hard work ladies. I have been knitting and crocheting since I was in fifth grade (40 yrs) . I also enjoy making jewelry and recently started quilting. Needless to say I don’t spend too much time just sitting. My main crafts are card making and paper crafting. I started a Smash book this year and might like to try art journaling in the future. I love to sew. That reminds me! I need to get started on my wee ones Christmas PJ’s! I dabble with crocheting and like to make prayer shawls. I love crocheting and knitting. I love to cross stitch. When I’m very stressed or tense it’s my “go to” thing to do. You can only think about it while you do it. I use to do small, quick projects. Now I do large ones over months of time but, it pays off with the results. I love to olden days samplers the most! Photography is my main hobby besides paper crafting. I dabble in crochet, furniture building and home organization as well. Guess you can say that my interests are pretty eclectic. I make jewelry but lately it has been crossing over and I’m making it with paper. And I feel like I’m cheating on stamping when i spend time on that! I scrapbook and dabble in beading. I occasionally cross stitch and crochet. I also like.making my own jewelry! I also like to sew. I’m not very good at sewing but I’m trying! I learned a new craft (well new to me) several years ago and it is Swedish Weaving. Lots of fun! Very relaxing to do it. Love this release! Love to bake. And trust me, that requires its own skills. In the winter I enjoy knitting socks or a scarf. From time to cross-stitch and everything else that is creative ! I am busily looking for a new clock with more numbers on it to fit in all my hobbies. Stamping is my first love, but knitting is also a favorite…I’m really into knitting socks and love all the colors and stripes that are out there to work with! :0) I love the all the new “crafty” stamps & dies you have out this month!!! I used to cross stitch but haven’t in years. I am doing some knitting for gifts right now but it is not something I generally would do. I do love to do crafty things for my home though. Add in papercrafting and that keeps me busy enough! I love to crochet, bake, and make jewelry. I need a bigger house for all of my craft supplies! Maybe not technically a craft, cooking is the one place I can find time everday to be creative and the immediate satisfaction of sharing with my family is a major bonus! And if i can find time to sew a little too all the better! I didn’t realize that there were other crafts. But, I cook, and cross stitch, too. Card making is my first love. I also make flower arrangements and wreaths. Quilting and/or sewing is another craft I try to make time for. Card making takes a lot less time to set up, though. I love all sorts of crafts! I enjoy scrapbooking, making t-shirts with my cameo, and anything with paint!! Right now I am frantically working on finishing up a very detailed cross-stitched Christmas stocking for my daughter. I have her sister’s done (they are twins) but there is now way they will be going up this year until they are BOTH done. I also scrapbook, am an avid photographer, cook/bake, and garden. Really, can you ever have too many hobbies? I was always a cross-sticher before I discovered papercrafting and it is still a craft I enjoy especially during the long cold winter nights! Stamping is pretty much my only craft and has been for about 10 years now. I make cards, scrapbook pages, and little gifts for teachers and friends. Oh just: sewing, quilting, x-stitch, embroidery/crewel, knitting, crocheting, costume-making (employs a mix of crafts), baking (I cook because I must but I bake because I love to), just getting into alcohol markers and the coloring of digital images, stamping/card making, scrapbooking and more recently digital scrapbooking (try it, you will be a changed scrapper and for the better), and reading (probably my first hobby as a child or maybe that was coloring!). Phew, maybe that list and two part-time jobs is why I find it challenging to finish things?! I recently became a self-taught crocheter and have been making dishcloths by the dozens? Anyone need one….? I also like to dabble in quilting and Sculpey clay. Books-I love making handmade journals for gifting (& using myself.). They are so fun to store new ideas or thoughts to reflect on later. And rubber stamping really adds to the pages! i love to make quilts almost as much as i like to make cards! While stamping is definitely in the lead at the moment, I also knit, crochet, quilt, scrapbook, and embroidery. I love to knit, especially when the house is quiet. I can’t afford them all and certainly don’t have time for them all!!!! haha! I also enjoy sewing, quilting,knitting and crochet, embroidery, baking and I collect Fiesta dishes. If the little good fairy would visit my house more often I might actually get to enjoy all of my crafts!!!!! I knit, crochet, embroider, sew, make jewelry and scrapbook! I love to make things! Card making takes up most of my discretionary crafting time but I also like quilling. I’m amazed at the variety of images one can make with rolled up strips of paper! This month’s release may be the inspiration I have needed to return to “hand-work” as my mother called it. I especially enjoy a crochet project during the winter months or maybe some of the hand-made jewelry I have attempted and not finished! Does baking count as a craft? If so, that is another handmade thing I enjoy. I love to give hand made baked items, packaged up pretty at the holidays. I have tried my hand at sewing. And, while I enjoy it… I keep coming back to my first love of paper crafting. 🙂 Thanks for a wonderful release, Nichole! I love to crochet and I would like to sew a bit more,too! As a teacher of young children, I like coming up with creative ways to use all kinds of materials and techniques, and invariably, I am inspired and amazed by their wonderful ideas and creations. I enjoy crocheting and dabble at scrap booking, although that has taken such a back seat! Paper crafting is my main passion though. I love beading and cooking! I like to sit down at night and knit while I watch TV. My daughter loves to make beaded bracelets and I bead along with her so we can spend time together. In addition I like to sew and scrapbook. I’m usually game to try any craft. I started knitting again after many years away from it. The simple scarfs that can be made with one skein of yarn are pretty and practical. I also like to sew, have quilted and I enjoy corss stitch. Creating something artistic and pretty is good for the soul! I am new to paper crafting and really love it but I still make room to my other crafts like sewing,cooking, baking crochetting, knitting and just plain crafting. Making things with my hands is a joy. I have been learning how to sew for about 2 years and am just feeling confident in sewing on my cards, lol! 🙂 I am hoping to move on to fabric soon! Stamping is my primary love, however, I also make time to cross stich. This month’s releases fit perfectly into both crafts. Thank you. I was an avid counted cross stitcher before I started Papercrafting. Over the last few years I’ve done a little jewelry making too. I would love to try out the paper beads shown here in the blog but I haven’t taken the time yet. I love glass fusion. It still amazes me that I can take a piece of flat glass and turn it into a beautiful creation just by heating it up. Wish I had more time to both glass and papercrafts! Last year I just started knitting. I’ve also done cross stitch and embroidery. So this month’s release is right up my alley! I make jewelry and also do flower arranging. But my heart belongs to making cards. Cross-stitching and tole painting are the other things I enjoy doing. I love to crochet, and do a bit of sewing too. However, my next big crafting goal is to learn how to quilt! I used to do loads of cross-stitch, making so many of my Christmas gifts (I have a few pieces left for me). But…now I love making cards & scrapbooking so much that I hardly have time for anything else. With 3 grandkids to scrap now, I seem to get more & more behind. Actually I’d love to have something more mobile to take with me, perhaps I should learn to knit! I like to make jewelry a little but honestly I am pretty much stuck on stamping! I’m a big fan of all crafts. I’ve dabbled in stamping, scrapbooking, cross-stitching, etc. One of my favorite things to do is to walk around craft stores and craft fairs and look at all the various craft projects that are out there. The possibilities are endless, which is why crafting is so much fun!! I learned to needlepoint from my grandmother–it’s so old fashioned but I really do enjoy it. Card making and paper crafting are definitely my primary crafting and I can finish a project more quickly. I also enjoy beading but papercrafting is #1 for me! Card making is my first love, but I do scrapbook and have made a couple of flannel rag quilts (with my mom’s help)! I love making anything my son would be excited and enjoy. Decorating the house is one and making handmade stamp from eraser is another. He got almost all of his favorite cartoon characters stamps so his stuff can be personalized including his lunch bag! Papercrafting is my main craft at this time. That includes anything I can do with paper, such as quilling. I have been an avid counted cross-sticher, but my stamps and paper addiction do not leave much time for that. I always think about combining the two. I love to attempt quilting and cooking, but I love scrapbooking the most! If cake-decorating is a craft, that’s one I enjoy. Just like stamping, people who don’t do it think it’s magic. Very gratifying! Crafting has always been a big part of my life. I love to knit. I also do rughooking, quilting, English Smocking and heirloom sewing. You name it and I’ve probably done it! I love to make jewelry. That is why your paperbead collection is so much fun for me. I love to knit and I make jewelry, I usually combine my stamping with my jewelry making. I love silver clay for just that reason. I knit every night, year round and when it is not 100 degrees here in Austin, I putter in the garden. Paper is my passion though and I make cards every week of the year! Cardmaking is still my favorite, but I also enjoy cross-stitching and quilting. I would love to take up jewelry making, but never seem to find the time. I’ve tried it all in my crafting career. I must say that I’m always drawn to paper and fabric. I’ve been a quilter since 1989…so I make time for that. I also make time for childrens crafts as I volunteer with special needs kids teaching art and crafts. I love to cross-stitch. I was so excited about this month’s stitching inspired theme!! I love almost everything. I have supplies for painting, beading, polymer clay, crocheting and general crafting! My other passion is gardening. I love flowers and working in the yard. I’ve also started to mess with making bracelets and I sew a little bit. Besides card making, I like to make silk flower arrangements, paint pottery/ceramics, and make candles. Paper crafting always has and will always be my first craft love and PTI has enhanced that love to the very extreme. I almost gave it up until I found Nichole and Papertrey Ink! Thanks to all you fabulous women and your incredible talent! It has fostered my craft and has pushed me beyond boundaries and has opened up new doors for me in the paper crafting world! I’ve recently gotten back into making quilts. It has been many years, and I am loving all the new ideas in quiltmaking. Sewing bags and purses is my other top craft addiction. I go back and forth between stamping being my top priority and sewing being on top of my to do list. Knitting! And you nailed it this time. I travel a lot on business. When on the road I knit, when at home, I stamp. Now I can send interesting cards to the knitters I’ve met and become friends with all over the country. Thanks! Besides stamping, I love photography and scrapbooking and beading! I love colour and I think that’s why I love crafting so much. I am an avid cross stitcher but it pales in comparison to my first love, card making. I also write in my spare time, although not sure that is a hobby as much as a craft. I enjoy making time for quilting, cross stitching and crocheting, not to mention scrapbooking, card making and stamping! Oh for more leisure hours to pursue these hobbies. I used to tole paint, but since I got involved with paper crafting, card making and scrapbooking are my main crafts. I think I love them, because they are much neater and easier to handle than painting. I like to sew and bead! I made my daughter’s Red Riding Hood costume this year for Halloween and I like to make other clothes, ornaments and stuff for the house. My friends taught me to knit last year. It’s great to knit while watching tv. How convienent you chose to focus on knitting this month! Primarily I am a scrapper but during this season I make time for cards and a little knitting perhaps and ornament making. I love too many things. I’m currently learning Illustrator and the many ins and outs of photoshop. I dabble in a few things – LOL! I love to making glass beads. I make PMC jewelry pieces and will often use my stamps to add texture to the clay before firing. I paint using watercolor and oils, I draw and I make dolls. I really like mix media art, where I can take several of the crafts I love and combine them. But I am fascinated by anything with paper, which is why I love to make cards. Stamping is my main hobby, but I have many other hobbies, when I can find the time, like sewing, crocheting, knitting, home decor. I come from a family of crafty people, so it is in the genes. After card making, scrapbooking is the other craft I really enjoy. I guess photography isn’t a craft, but it takes up as much time as both the others! I like to crochet. There’s nothing better in winter than to sit by the fireplace with an afghan project in your lap! Reading, cooking and baking, and crocheting. I have just got my very first sewing machine so I am teaching myself to sew (on fabric AND cards!) and I have also enjoyed jewellery making in the past. I love smashbooking. Smashbooking is a more informal (and quick) type of scrapbooking where you literally smash your memories into a journal. I have also just started my first art journal. I love how freeing it is. Number one is and allways will be stamping. But what i also like to is knitting and crochet. And I prefer to use as much color as i like. Love doing that. So different than stamping. I like to knit and sew. Stamping takes up the majority of my time! I do crosstitch occasionally, if I have a special gift in mind. I also recently made some fall decor for my home and enjoyed that process. But stamping is my true love! I LOVE to sew, making something is so much fun. Card making and scrapbooking are my major hobbies but I also like to make home decorations with lots of different materials and knitting and bordery is also a fun thing to do. If we only had some more hours in a day. Netxt to stamping, scrapping, and papercrafting, I enjoy making mini books and altering different things. I also like to come up with various craft projects for my students! Give me paper any day and I’m a happy woman. But I do enjoy many other crafts, anything that I can create for friends and family. Especially things with fabric. Love the new releases and so glad I decided to check out Papertrey Ink. love that its a local company for me. Ohio drafters ROCK! Unfortunately I don’t have any other crafts. Any free time or money is taken up with paper crafting. If I had unlimited time and resources, I would love to learn cake decorating. I love to sew! I used to make all my own clothes and shirts for my husband and son. I love knitting and I’m just getting into quilting. My SIL who has been quilting forever is helping me get started! Quilting and sewing are among my favorite crafts. But I have never met a craft I didn’t like. I’ve been known to knit, crochet, cross stitch, wood work…. So many crafts, so little time. I recently started going through all my beading stuff in my studio. Wow, I have some really pretty beads! It started me thinking about doing some beading again! I love everything papercrafting and because I don’t have a lot of time to craft I don’t have any other hobby’s. Photography is really my main thing, which is what drew me into papercrafting and using my photos in my cards. I have always wanted to learn to knit and maybe that will be a goal for me in 2013!! I love to cross stich, i do it while i watch tv or a movie, so about every day! I’ve enjoyed sewing and counted cross stitch in the past, but now I love stamping! My first love is stamping/cardmaking, my other crafts are scrapbooking and sewing! Lately my favorite thing to do is make stick pins with beads to adorn cards, and recently purchased some clay and molds to make embellishments for cards as well, but I also am trying to teach myself to knit, crochet, and sew using DVDs. Since I was a little girl I have been doing needlepoint, embroidery, and latchhook. I really love crafts of all kinds! Thanks for the chance to win! Card making is my main focus these days. When I see something on Pinterest that really strikes my fancy, I’ll put away the stamps for a day or two. I could not resist making those tulle wreaths! I like scrap booking and also making different home decor ideas found on Pinterest. Besides cards, I like to paint. It’s very Zen and relaxing. I also love scrapbooking…so much fun to relive past memories but it also gives me another excuse to use all my stamping supplies! Is photography a craft? I love to take photos and do projects with the pictures like mini albums and scrapbooks. In addition to my papercrafting addiction, I am also a quilter. I have my homemade quilts on each of our beds, as well as supplying my daughter and her family with cozy, warm flannel quilts to keep them warm. I love knitting, especially socks! And cross stitch and baking and quilting…but most often when not stamping, I am knitting! I love to quilt too and crosstitch and make jewelry..make pottery..paint….but all my time is taken by making cards…just LOVE it..and this release was STUNNING!! Definitely trying to learn more about sewing and photography! I scrapbook and also love to sew and make quilts! I like to knit, basic sewing/quilting and I used to do cross stitch. I recently started making jewelry. Well, if Bingo isn’t considered a craft….I also love to sew, cross stitch, paint, and make jewellery. Card making would definitely account for at least 95% of my crafting time. Other than scrapping and stamping, definitely cross-stitching! I love it and have done it since I was a kid. thanks for the chance to win! I enjoy working with beads, making jewelry or embellishments for my cards! A few beads can add so much pizzazz. I love to cross stitch and crochet. I am so excited about the new sets. I LOVE cross-stitch so this release is right up my (stitchin’) alley! I have recently dragged out my sewing machine and have started working on a quilt…its’ been years since I’ve created one. Thanks for the chance to win and the release is gorgeous. Way too many to choose from! I love to read or crochet too. I love to make time (which lately has been very little) for sewing. Just love the sound my vintage singer machine makes. I love to make Jewelry, but scraping is my first love. I do so many different crafts besides stamping – cross stitching, quilting, crocheting, scrapbooking and sewing small items. I wish there was more time in the day! Sewing has always been my first love, but making time for it seems a bit more difficult than papercrafts. But I must say since I’ve started playing the violin I have noticed that I squeeze every moment out of the day to play, it is fast becoming my favoirite way to enjoy some relaxing time. I like to color with crayons and markers, so I’m known to buy cheap coloring books at the dollar store, gather my kids, and get a coloring party going! Papercrafting (cards, scrapbooks, and altered items) is my go-to craft. Outside the craft room I enjoy gardening and food preservation. I like to make different home decor items. Wreaths, centerpieces for the table are my favorite to make. I like to do ones for the different holidays and seasons. Love doing those silly paint by number kits, those are nice for a nice cozy snow day! Not really crafty but I love doing puzzles! I have a 1,000 piece one that the kids & I love to pull out on a rainy day! Other than stamping, I enjoy making jewelry and doing counted cross stitch. I used to do counted cross stitch, but with my aging vision it’s gotten a lot harder. I really enjoy everything I can do with paper. Scrapbooking is my main focus, but I’ve gotten into making cards because they are quick, easy and I’ve got all the supplies I need! I love making home decor items! I have found that it’s so much fun to remake things around the house to better fit my style. With almost all of the stuff I do I find some way to use paper crafting supplies! Quilting and patchwork. Thanks for another great release. I love to make “hair pretties” and gift baskets when I’m not making cards! I love to sew! Making gifts for others is a passion of mine. My other crafts include quilting and stitching, digital scrapbooking and photography. I’ve tried knitting and crochet before, but never seemed to get the hang of it. I usually have alot of different projects in the works! Stamping and creating cards is my main craft. I love to sew but usually only do this when I incorporate it in my card or work on a project with my daughter. I’ve always wanted to take up needlepoint. Other than that, I love photography! I am a knitting fanatic! I also quilt, cross-stitch, tat and crochet, but if I’m not papercrafting, I am knitting! It goes anywhere you want to be which is what is making me so in love with the knitting themed stamps – it’s my two favorite things combined! I love stamping most of all but I also enjoy making signs! I am a scrapbooker, I love making altered art, and working with fabric. I love making cards and scrapbooking. I do a bit painting as well. My other hobbies are to quilt, decorative painting on walls and landscaping! Thanks for asking! I also love to quilt. I love that both hobbies focus on taking smaller pieces and putting them together to make something wonderful. Thank you for all the lovely inspiration this month and for offering the great prize!! I like to do stained glass. I do stained glass windows and jewelry. I have done some cross stitch and my newest hobby is crocheting. Paper crafting will always be my favorite though! I like to make time for any craft I can do with my daughters. Great release this month! I love to make time for re-altering items in my home to spruce up the decor. It definitely saves on the check book and I end up with a one of a kind item. I am obsessed with stamping and papercrafting but I do squeeze in a little needlepoint every now and then. I also love decorating my house. I love doing embroidery – especially during winter. There’s just something so calming about it. I really enjoy quilting. I have made two quilts. Now that I am seeing the yarn stamps, I may have to take up knitting! Most of my craft time is devoted to card making. I also love to incorporate stamping into my holiday gift giving. I love trying new crafts and my latest hobby is beading. So easy and so many choices when it comes to creating jewelry pieces. Best of all, my daughters enjoy it as well! I make charms with polymer clay and really enjoy it. It’s a little tricky to bake, but it’s pretty easy to shape, especially if you have a mold. My kids get to play with it too, but I have to be careful where we use it. I used to cross-stitch a long time ago and am so ready to teach my daughters how to do it. I really like digital scrapbooking. I have so many kits I needed a drive for them alone, but I usually end up making hybrids with the digi kits and only a few actual digi pages. I’ve considered knitting or crocheting, but I can’t seem to sit still long enough for that. I’m one of those “To-Do” Crafters. I have a lot of things I want to do, but never have the time, so I host several craft parties throughout the year where I get to show people new techniques and love seeing everyone else’s projects. I have been into cross-stitch and quilting, but that all fell by the wayside when I discovered stamping. But lately I have discovered knitting ruffled scarves – with the way this yarn is made, I can make one each day if I’m so inclined……haven’t knitted since high school (and it just never took at the time), so this is a lovely surprise to rediscover! I enjoy taking pictures of a special party/reunion and putting together a little scrapbook to send to the hostess as my thank-you. Besides cardmaking, I also knit, crochet,do cross-stitch samplers, and beading. Recipe hoarding and cooking are my other hobby. I also love to draw and knit … when I can pull myself away from card making!! Besides papercrafting, I like to make fun button jewelry and hair accessories and pins with felt and fabric (and my Big Shot). I do have a sewing machine and knitting supplies! Thanks for the chance to win…such a great release!! When your a grandmother of 10, there’s always someone in need of my help! From costumes to room decor, to projects for school, it’s thankfully a family effort. Each of them was presented a handmade blanket at birth. I think the love those ‘blankies’ were given tickles and reminds me how much I enjoyed each stitch! I like to embroider and take photos (if you can call that a craft). Over the years I have dabbled in many crafts…folk art painting, cross-stitching and cake decorating to name a few. But papercrafting has been my recent obsession. I can’t get enough of it! I love fabric and I love to sew dresses and bags, scrapbooking, and making cards! Well, I love lots of other types of crafts but I barely get time for my paper crafting so the only other craft I specifically try to make time for are the crafts I do with my daughter. She definitely has the creative bug and I love to create with her and watch her little mind work. Her imagination totally inspires me. Scrapbooking! I also like to cross stitch but the patterns are so limited. Also scrapbooking goes so well with rubber stamping. My other hobbies that I enjoy a lot is to make cold-processed soap and candles! I have dabbled in almost everything, but my favorite crafting hobby – besides cardmaking & scrapbooking – is making Christmas ornaments. I have done this since I was quite young, and now have a tree with well over 400 handmade ornaments on it! Where do I start? I have quilted long before my rubber stamping. I also do some knitting, crochet, scrapbooking, beading, painting, lots of paper crafting, and enjoy learning new things that come along. With 4 teenage girls we have explored lots of crafts – knitting, crocheting, felting, needlecrafts, quilling, sewing, painting both acrylics and watercolors – in fact cardmaking is one of the newer ones that we all enjoy. I like to both crochet and knit and to sew small projects like little bags, tablerunners, notebook covers and such. I really enjoy experimenting in the kitchen, coming up with new recipes & using ingrediants I’ve never used before. I also enjoy making mini albums. I love to cross stitch, crochet, knit and quilt. I really love this release! thanks so much! I actually haven’t done much in years, but I do have several unfinished cross stitch projects that are more than just started (she says abashedly). Thanks for the fun inspiration with all of your release items. In all honesty, none! I only have eyes (and time & $$) for paper. It was my first love, and I’m ok with monogamy! My other favorite hobby is crocheting! I feel like saying, “You name it I’ve done it!” I started out with stamping then moved to basket weaving, then loom weaving, then silver stamped jewelry and now some knitting, a little sewing along with the stamping and paper crafts. So it’s like I’ve come full circle. I have to be doing something! I enjoy machine embroidery too. I have been known to incorporate it into my stamping. Besides papercrafting, I really enjoy digital scrapbooking. I love that I can play around with a layout…moving it here or there, resizing, changing up the colors…before printing out a final copy. Plus it’s flat, so very easy to store! I usually just do card making and occassionally scrapbooking, but I have tried crocheting. I do that sometimes. I have been playing around with and trying to learn a little more about photography, but honestly after this release and seeing so many people with their knitting lately, I really want to learn how to knit! I like to bake. Great release, makes me always want more. My greatest enjoyment comes from making cards but I love being creative with any project that involves paper (different colors, patterns, textures), and all the different kind of embellishments I can add to it. Before having several eye surgeries I enjoyed counted cross stitch. I am always inspired by all the projects done by the design team here! Beautiful release sets – love them so far! In addition to paper crafting I enjoy quilting, mixed media painting/altered art, machine embroidery, and some jewelry making. I stink at knitting and will some day master crocheting (think positive)! I am trying to keep up with all the new trends in scrapbooking and stamping and that keeps me busy . Kiddie crafts occupy my spare time finding cool stuff on pinterest to do with my son and daughter. Other crafts I enjoy are cross stitching, crochet (both thread and yarn), painting (all types), and then just the general “making stuff” like Christmas ornaments or picture frames or what have you. I have always loved to make stuff. I LOVE needle art! That’s why I’m so excited about this release! I currently enjoy cross stitch and punch needle. With this month’s release, I’ll be able to combine my love of needle art with my love of paper crafting…how wonderful! I like to do hand sewing and counted cross stitch while hanging out with hubby. A little of everything, but mainly sewing. Over the years I’ve made dolls, pillows, doll clothes, costumes, winter coats, even a doll house. Lately—just scrapping and stamping. I am a wanna be quilter. I’m fascinated by the art of it all, but struggle with how long the process takes. Paper crafting is by far my favorite, because you can see results quickly. But I am going to make more time to quilt! Thank you for a release full of so many gorgeous new products! In addition to scrapbooking and photography, I enjoy crosstitching. Hope to add quilting to the list next year. Crafts you say! Sewing, stamping, knitting, crocheting, and just about anything I can find to keep my hands busy. Great release. Project life as of lately. Knitting, sewing, anything really. With a new baby on the way next month, I’ve been getting out my flannel and planning to have a few new baby blankets sewn. I have also been working on felt quiet books. Using dies makes it go so much easier. None. I’m perfectly happy with my paper, stamps and embellishment collections that have taken up about 30% of my house. Now, it would definitely be a great surprise to win the entire release since PTI gets my entire stamping budget monthly ..hint,hint. What a wonderful wintery release…warm and cozy! I’ve done some book binding, cross-stitching, and quilling. Card making is still my main love, though – so fun playing with paper and ink and getting to complete a project in an hour or less! Besides card making, I do a teensy tiny bit of scrapbooking and sewing, and a fair amount of knitting and cross-stitching these days. Thank you for all the beautiful DT inspiration this week – it has been fun! Since I mostly create cards and scrapbook the other craft I really enjoyed was quilt making that I rarely find time for any more. My second love to paper crafts is knitting, so I was very excited to see knitting themed items in the last two releases. I love cardmaking but when I was a child I was taught embroidery by my grandfather and I still love to do that. I love to crochet.. mainly afghans. Make great gifts and keep you warm! Besides Paper crafts, I love to do decorative painting. If it doesn’t move, Paint it! Scrapbooking and card making are for sure my number #1, but if I had time, then I would dabble in more home decor type of crafting, vinyl decals for home, home made wreaths etc. Holy moly. The list is so long. Like most of us here I am a crafty girl. To pick one besides paper crafting, which is at the top of my list right now, would be crochet. I moves along quickly which I like. Insant gratifcation. Thanks for the great release! Too many crafts! I sew, knit, quilt as well as paper crafting, scrapbooking. I also started doing some jewelry (mostly bracelets) after PTI introduced the beading paper and dies. I always have two or three different crafts on the go at any one time. Right now I’m making beaded bracelets, sewing little pouches to hold them, working on my Christmas cards and tags and knitting a baby sweater. I also have to finish quilting a table runner and place mats for Christmas. Better get back to it all!! I enjoy all types of crafts, scrapbooking and quilting are my favorite. I enjoy home decor sewing when the need/urge arises. I love to sew for my home…slipcovers, drapes and curtains, duvet and pillow covers. But since I’ve started stamping with PTI products, the only sewing I’ve done has been on cards! I love to process and dye wool and other fibers into beautiful batts for spinning. I love to crochet and make little gifts with the sewing machine. Mostly I combine all my crafts to create gifts, the stamping and cardmaking makes it complete! I mostly just stamp. But I want to get back to crocheting. I used to cross stitch and really enjoyed it, but haven’t done it in quite a while. Besides cardmaking, I also enjoy scrapbooking, gardening and sewing. Since I got hooked on stamping and cardmaking last year (thanks to PTI! ), I’ve rather neglected everything else. I still sew and crochet occasionally, though. I love to scrapbook, quilt, sew and I try very hard to knit and crochet… still working on the last two LOL! I also love polymer clay and making jewelry. I use to love to cross stitch until I aged and needed reading glasses to stitch. Loving this release! It’s inspired me to just pull out stronger reading glasses and stitch again! In addition to card making, I enjoy drawing (line drawings, usually with Copic marker coloring) and knitting. Sometimes a bit of embroidery or sewing. Knitting is my other crafty passion. If I could figure out a way to stamp and knit at the same time, I would be in heaven! So excited about the new knitting stamp sets. I love encaustic painting and enjoy making jewelry too! Besides paper crafting I enjoy quilting and cake decorating. Making any kind of craft can be fun and relaxing. I like making small ornaments and jewelry. I’ve already begun decorating the house for Christmas! My husband says it looks like Macy’s when I am done. Making all the decorations will encompass a lot of my time for the next several weeks. I really like to make jewelry and hair accessories for my youngest daughter…she still is wearing them proudly :). I love to stamp and make cards, but sometimes I make small figures our of clay, especially around the holidays. I even use the stamps to impress the clay for embellishments. Really love to stamp! Well, I used to make time to golf, until Papertrey Ink came into my life! I do still knit and scrapbook a little, but it’s hard to do when you keep bringing us more wondeful products! I make time for sewing. I enjoy sewing little gifts for my 2 grandchildren. I like making stick pins and charms, and am learning to crochet. As always, papercrafting is my favorite hobby. Thanks for the chance to win! I make candles and body products – body butters, soap etc. I also make Christmas earrings. I sell them at work, I call it my Christmas Shop. Everyone loves the candles. My workmates do value a handmade card though, which is great. I also enjoy sewing and quilting. My craftiness began when I was around 7 years old with sewing. Love doing anything with my hands. I’ve dabbled in quilting, cross stitch. decoupage, handmade christmas orgnaments, cake/cookie decorating, knitting, crochet. I have an embroidery machine I like to play with now and again~thank you so much for an exciting release and the chance to win! I really enjoy sewing as well, and that is why your stitching/sewing sets this month are must haves for me! I like to make time for quilting too! My grandmother taught me how to embroider many years ago and to this day I love to embroider. I have such fond memories of her teaching me this craft and think of her whenever I sit down to work on an embroidery project. When I have extra time it would be scrap booking, and cross stitch. Thanks for all the wonderful inspiration. What a great release! My favorite thing is comfort food, but I also really love the cable knits. The other crafty thing that I do most is crochet baby blankets. Thanks for the chance to win! I like all crafts and enjoy learning new ones. I already made some patchwork, cross stitch, painting and so an. But card making and scrapbooking are my #1. Aside from cardmaking I make beaded bracelets, and necklaces. I also love to make 3-d beaded flowers. I used to work with polymer clay but have given up that to make more time for painting/drawing. I also love to sew and for the past 10 years I have taken up tatting. The only thing I haven’t taken up is knitting/crochet. I feel like the kid looking in the window of the Worthington Candy store. My eyes are taking everything in yet I can’t have it all. I have a list made for the candy I want the most. Can’t wait till I can press the send button to order the stamps and dies. Card making is my only hobby because I love it! I’ve always loved sewing. When my girls were small I loved to make dresses for them. Now I am trying my hand at quilting. 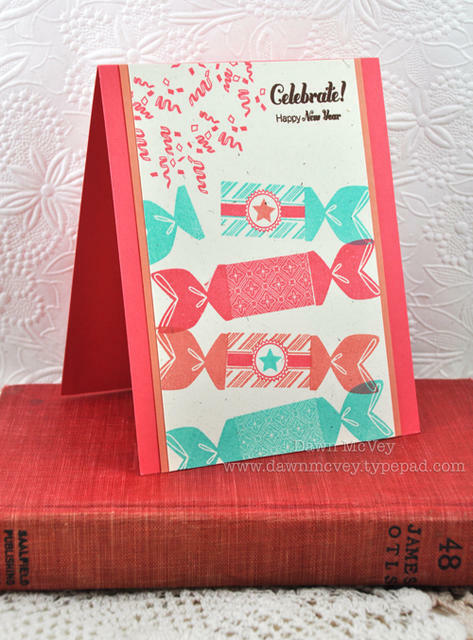 I also love to scrapbooking – it’s what led me to cardmaking. Fun release this month! Well paper crafting is my first love. But I try to find time to sew, if its counted cross stitch or with my sewing machine. I love to craft!!! I love to cross stitch, but now I only make things for special occasions, such as ring bearer pillows for weddings and bookmarks for communions and confirmations. Although paper crafts are my main form of entertainment, I also enjoy counted cross stitch and sewing from time to time. Loved all the crafty elements of this release! I like all crafts and enjoy learning new ones. Whether it is sewing, crocheting, baking, etc. I inherited the love for crafts from my mother. As my mother used to, I always have a little bit of something going on, like, quilling, cross stitch, jewelry making, quilting, and lately amd I LOVE it, mixed media! I enjoy embroidery so this release really caught my eye. What a great release! I love to crochet. I learned how to crochet pretty much as soon as I was able to hold the hook in my hands. I love to knit when I get a chance, this year I am making knitted scarves for the ladies in my family!! I also love to make homemade Christmas tree decorations, I am loving all the great ideas I am finding on Pinterest these days!! I’m just learning how to sew so I enjoy trying that whenever I can drag myself away from my first love, papercrafting. Just card making for me although I enjoyed Betsy’s clay challenge. Besides making cards, I am currently into mixed-media art. Have done a ton of cross-stitching in the past and have many large, framed pieces that I am very proud of. I’ve recently taken an interest in sewing. My sweet mother in law gave me a nice sewing machine. I am just at the stage of learning how to work the machine, but the thought of home made quilts are dancing in my head! I love everything papercrafting, but I have also enjoyed sewing, cross-stitching, home decorating, and making over favorite thrift store finds. I knit and embroider but also enjoy sewing doll clothes. I do know how to cross-stitch but it has been a while since I’ve done it. I really want to learn how to knit. Oh what other crafts do I make time for? Well I’m into cooking more these days and since I’ve been trying new recipes I’m into making small recipe books and giving them as gifts. Stamping is pretty well my only craft. Before stamping I did a bit of cross stitch. Thanks for the chance to win. I love to knit and sew baby quilts. I make one or two quilts a year and donate them. I also end up donating a lot of the cards I make as well. After Christmas, I love to sit and knit a afghan or baby blanket. It keeps me warm too. I also love to sew. I used to cross stitch all the time and love the new stamps and dies you’re releasing this time. I have decided to work on a cross stitch project this winter. Thanks for all your inspiration! I like to garden, so I like to use my flowers for decorating. I like to knit, althogh I have not done much recently. I also like to make pot pouri, but I am finding it harder to find the supplies. I love making hair bows for my daughter and her friends and I also enjoy cross stitching. I take photographs, so while I don’t think of that as a craft I do think of it as another artistic outlet. I’m kinda a “Jill-of-all-Trades” gal. I REALLY love to knit & crochet, but I also love to sew 🙂 Anything that allows me to be creative! Besides cardmaking, I also like to scrapbook, quill & do punch needle. I don’t find much time these days to do anymore than a little cardmaking & scrapbooking though. Making art for the garden, cross stitching and glass mosaics! I enjoy scrapbooking and crocheting. I think I may have tried almost anything that has become a trend over the years but I love to sew and crochet. I quite enjoy incorporating sewing on my cards as well. maybe next I’ll try out making my own crochet lace? I love crochet, make jewelry, sewing and baking goodies (since my husband dose all of the cooking). 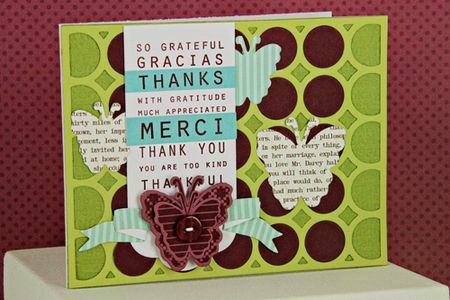 Scrapbooking, and card making are my first loves, I can’t get enough of stamping pretty cards, and layouts. To go with my addiction of stamping I love finding new supplies and ideas for when I can’t to my crafts, Pinterest helps with that. I used to cross stitch and I loved it. I must admit that I just don’t make the time for it anymore. I barely make time for scrapbooking and card-making. In fact, I’m way behind on my scrapbooks. I am loving all the samples you are showing – once again, your creativity amazes me!! In addition to paper crafts, I enjoy painting and making mixed media collages. I love trying new things and lately have been dabbling with block printing techniques. It is hard to find time for it all! I enjoy crocheting! I enjoy making blankets for others. I love to knit and crochet. I also make puppets. I love creating for my family! I decorate cakes, crochet, scrapbook, create cards and I love sewing! My sewing machine resides on my craft table even more frequently than paper and ink. Whether I am patching worn levi’s, or making a quilt, I use that machine a few times a week!! I love to scrapbook, make cards and other papercrafts; I knit, crochet, embroider and quilt….although I haven’t done in quilting, embroidery or knitting in a while. I also like to make jewelry and paint. Just about anything crafty, I enjoy – just don’t have enough time to do it all anymore. This month’s release has inspired me to get out my needles and have some fun! I love to make time to knit. My mother and gradnmother taught my sister and I when we were about 8 years old. At this moment I am craving out time to make four baby sweaters for co-workers that are all due the first few months of the new year. my grandma taught me how to cross stitch when i was little…but i haven’t done that in quite some time. i love to make crafts from felt like little stuffed animals and brooches. i also like to do mixed media crafts 🙂 and sadly i don’t know how to crochet or knit. it’s making me really sad right now that i live 5 hours away from grandma! Quilting and hardanger embroidery are also big favorites of mine. but most of all even though not a craft….. MY DOGS!!!!! My first passion is stamping but when I have some extra time I enjoy knitting (scarves only, I’m a beginner) and I make jewelery (necklaces and bracelets). Recently it is felting, I’d just smile looking at the mashmallow color of wool ! Also I’m addicted to any kind about fabric…….wow hope I could have more time to play with my crafting hobbies ! I am not really crafty, except for card making. I do enjoy baking, however. My first love is anything with paper, but now and again I like to paint on wood. I love anything to do with home decor. Repurposing miscellaneous thrift store finds, for example. I like to quilt. Thanks for the chance at such a fabulous prize! I enjoy sewing and making home decor things. I love to repurpose anything I can get my hands on. I used to cross stitch (before stamping took over! ), but I occasionally like to make small quilted items just to use as accents around the house. I like a rather rustic look, nothing perfect or fancy. I love the sewing emphasis in this month’s selections. I have recntly started beading. My first project was to make the Papertrey paper beads. I had great success and I am making a dozen bracelets for Christmas gifts. Thanks for always inspiring me. In addition to cardmaking, I enjoy needlepoint, cooking, taking pictures and deep-sea fishing! I have dabbled in jewelry and also enjoy making quilts, but nothing has grabbed me like card making. My collection has grown leaps and bounds and it is mostly due to companies like yours that show me so much inspiration and “how to” posts. I like to sew, make scarfs, some time jewerly. Any i think i can do it i make it. I enjoy sewing and crocheting, but only when I’m not stamping! Besides making greeting cards, I do mixed media. I love to get my hands on paints and stains and stamping and layering a nice colorful canvas. I love all kinds of crafts, but lately I’ve made ornaments and decorations for various holidays. And I sew quite a bit, too. Baking and jewelry making are other things I try to make time for also. 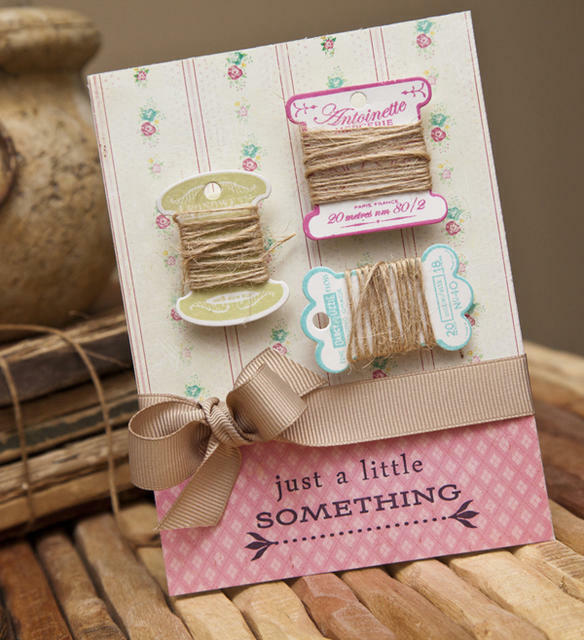 I turn my hand to knitting, making jewellery and candle-making – but card making is my favourite hobby. I have about three different knits on the go and tend to pick these up in the winter months when all I want to do is curl up in front of the fire! I learned to smock a couple of years ago. I also do a little sewing and machine embroidery. I used to make jewelry. I have so many crafty ambitions, but not nearly enough time. I’ve cross stitched since I was a teenager (had to be working on a project while my mom was!) I used to do beading and jewelry making. I’ve tried to quilt, but have given up out of sheer frustration (one of these days I’ll try it again!) And now, I’d really like to learn to knit. By far, paper crafting is my most devoted hobby, but I’d love to have more time to dedicate to them all! I like to dabble in lots of different things. Anything I can do with or for my kids I’m all for! I love to read and spend way too much time doing it!! In addition to stamping, I like to make mini scrapbooks and any type of 3D-project. I sew a little bit too. I used to do embroidery, needlepoint, and hook rugs, but haven’t had the time in recent years. My other big passion is decorative painting, but I have always been a crafty person. I knit, crochet, needlepoint, scrapbook and on and on… My great-grandaughters, 6 & 4 just love my crafty room and we spend many hours in here doing lots of crafts. They have the bug like me and it is so much fun! I love to make altered items! Trinket boxes, mixed media canvases and more! I love cardmaking, stamping and scrapbooking. I have started making paper flower, and stick pins. I really enjoy scrapbooking, and recently have picked up my cross stitch hobby again. I also enjoy knitting – you can just pick it up when you have a few minutes, and it’s very relaxing! I love to sew. I just made a fall themed half apron to use for Thanksgiving! My second favorite craft is to making charm bracelets out of old vintage costume jewelry. It’s fun, easy and the quality of old costume jewelry is amazing. Wonder if old vintage jewelry could be a stamp set? I love to cross stitch and refinish furniture pieces. I also love to sew or at least think about sewing and all the things I would like to make. I have a couple of favorites. My “other” favorite crafts, aside from paper crafting, are cross stitching, making penny rugs and sewing pet beds and cat toys. Aside from all things paper, I enjoy crocheting, cross-stitch and simple jewelry making. I think my favorite part of crafting; however, might be accumulating a variety of supplies just in case I’m bit by a new creative bug. My mom has been teaching me how to knit scarves and I have really enjoyed that! Anything to do with paper, card making, scrapbooking etc. I also Love to cook and bake! I also enjoy sewing and jewelry making. I love to sew & quilt and I’ve been getting back into it again. I also got my mom back into it and it’s such a great feeling. I don’t have too much extra time these days but I also love to knit and do cross stitch. Sewing projects would come next for me. My husband’s Christmas gift quilt I made him years ago is worn…time for a new one! I love all the new releases! I am just learning to sew and always make time so that I can learn more and give more hand made gifts! I Love sewing! I am a craft loving person. I like to do it all. I just don’t have all the time. I enjoy card making scrapbooking sewing and very little jewelry making. I want to learn to knit and crochet! Those are next! When I’m not stamping, I love to scrapbook! Card making and scrapbooking are my two favorites. But I try to get some sewing done for the grandkids too! In the winter, I enjoy knitting. This year i am knitting felted bowls. I will fill them with my Christmas biscotti and give them as gifts! My goal is to make about 14 of them. 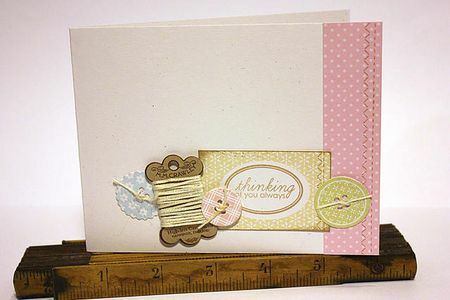 I have 5 done and I love how I can change things up, like card making, with colors and how many rows to control the height….. just great indoor fun! I enjoy a wide variety of crafts. Stamping/card making, sewing and DIY! I love to do mixed media canvas work. Combining paper, stamps and all sorts of 3D objects and inky goodness together. I’ve done so much over the years that it’s hard to say just one. I have needle point, crochet, paint, pen and ink, sewing and scrapbooking. I think of everything, pen and ink was my favorite but right now it is scrapbooking. My other craft is weaving. I consider myself a “serial hobbyist”! I enjoy many, many hobbies, but papercrafting is my favorite. I’ve done stained glass, pysanky eggs, knitting, sewing, decorative painting, polymer clay, engraving and sandblasting, mosaics, soap making . . . I believe I need therapy for this! Hahaha. I love every craft, particularly sewing. Card making is really my passion but I also enjoy sewing, cross stitching and painting. I also enjoy when I can use different crafts in my cards. I love quilting, baking, and I have recently learned how to make beautiful bars of homemade soap! I love to bake–especially pies and cookies. With a husband and 4 kids, there are always plenty of “testers” available to sample new recipes I try! I love cross stitching and just recently started crocheting. I started my love of paper crafting with making cards … then started scrapbooking and now am back to my first love of stamping and making cards. I really like to knit. It keeps my hands busy, and is really meditative for me. I love all things crafty. My sweet little Grandmother taught me to crochet when I was 8. I started learning to sew a couple of years ago and I refinished my first piece of furniture this year!! Jewelry making, some crocheting & baking muffins. I recently rediscovered my love of sewing when I had to purchase a new sewing machine and love that I can also use that as well as a bit of beading along with my paper crafting projects. Now Pinterest just fuels the fun!!! I enjoy scrapbooking and that is how I started. I now enjoy cardmaking and making gifts including boxes, bags, and baskets. Is cooking a craft? Well,it is creative and the people I do it for seem to like it – a lot. So I will say cooking is certainly my other craft. Just card making and scrap booking. Unless you count trying new recipes from Pintrest! I love all kinds of other crafts. I find that my papercrafting carries over into other tpes of crafts often. It’s just fun to be creative. I indulge in a little jewelry making and am teaching myself to crochet. Actually, stamping and knitting are my main hobbies with a (very) little sewing thrown into the mix. They keep me pretty busy. If I wasn’t of an age where calories count so much, cooking would be on the list, too, lol. I also LOVE to read but I don’t think that can be considered a hobby, or can it? Card making and scrapbooking consumes most of my creative time these days, but I have been known to dabble with cooking, crocheting, knitting, sewing, polymer clay, wire, beading, cross-stitching, macrame, tatting, upcycling . . . I just love keeping busy with beautiful things. I just startet to learn how to sew and I love it, although stamping will always be my favorite hobby! This months release was right up my alley. I love the fiber arts-knitting, cross stitch, felting…paper and yarn, what could be better? I have never been much of a crafty person, so I don’t have any other crafts that I do. I am totally obsessed with stamping though. Stamping is my main ‘love’ for the last 18 years! Before that it was quilting and sewing clothes. I was hooked on sewing the first outfit I made in 7th grade! I’ve done several other crafty things over the years but stamping and blogging are it right now! Besides papercrafting I sew, create with felt, play with clay with my daughter and I guess you could say cookie decorating too ;). Might even be the winter I learn to knit …. Scrapbooking and card making are my primary crafts. However, I do help the ladies of the church make quilts every week. I also enjoy jewelry making and crafting home decor items. I like sewing and making wearable art. My recemt favorite “other” craft is making feathered headbands. It’s so fun to see the smiles on my girl friends’ faces when they wear a headband with a crazy feather sticking out of the top! I haven’t met too many crafts that I haven’t loved, but my favorites, other than paper crafting of course, are knitting and sewing. I just love how you’ve tied them all together with these amazing coordinating sets!! I enjoy making jewelry as well. BUt I find myself doing one or the other sometimes. Sometimes though I get to make the jewelry then the packaging/cards to give it with – that is a fun project! I also like to make jewerly and knit. I have done a lot of different types of crafts, but I really love making cards, jewerly and knitting the best. That’s an easy one! I just love to knit – love that it’s so portable and easy to whip out when you just have a few minutes of spare time. Which is why I love this month’s release with the knitting sets (as well as last month’s sweater bkgd). The sets are so perfect for knitty gifts! I love making time for jewelry making. Haven’t done it in a few months, but it was the first craft I picked up! Thanks for sharing! I’m NEW to knitting so I’m dividing that with my scrapbooking time! This new collection you have is perfect for that! Thanks for the chance! My passion is cross stitch. I can’t wait until the end of the day when the dinner is done and the kitchen is cleaned so that I can stitch a for a few hours before heading off to bed. Along with stamping and scrapbooking I also love to knit, sew, and crochet. I grew up knitting and crocheting. I also have done some cross stitching and needlepoint. I also sew and quilt. A few years ago my daughter got me into stamping and now love that with these new products that I can combine my hobbies. My newest hobby is scrapbooking but I’ve put some time into making beaded jewelry. Putting the 2 together – paper crafts and making beads is next on the list! I Love this Awesome release!!! Everyones projects are so AMAZING! I also love to make home decor projects…I’ll try just about anything if I see something that inspires me :). Have a wonderful day! I enjoy cross-stitching , knitting and crocheting when I find the time if I am not creating cards. I love to scrapbook and make cards and that is about all the crafting I do. I try other things every now and then but always come back to scrapbooking and making cards. With the birth of my granddaughter, and only grandchild, I renewed my involvement in scrapbooking. 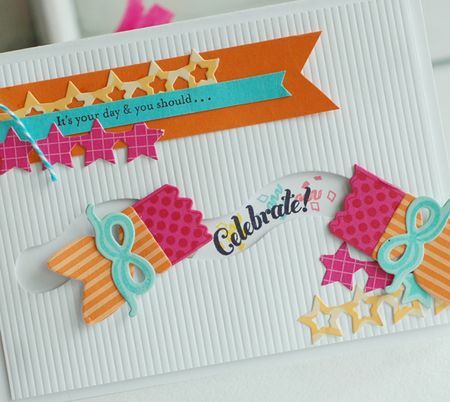 It’s great that card-making supplies and scrapbooking go together so well. I love to sew and cross stitch…both are so relaxing and you can pretty much make anything you want. It feels so good to be able so say I made this! I love making cards -my favourite for sure. Well since last month I’m making some jewlery and natural cosmetics. 🙂 Thanks for the chance! I love your cards. I love to crochet and knit! Years ago I did a lot of counted cross-stitch, so the Stitched Sentiments set and super cute embroidery hoop die brought back many happy memories! 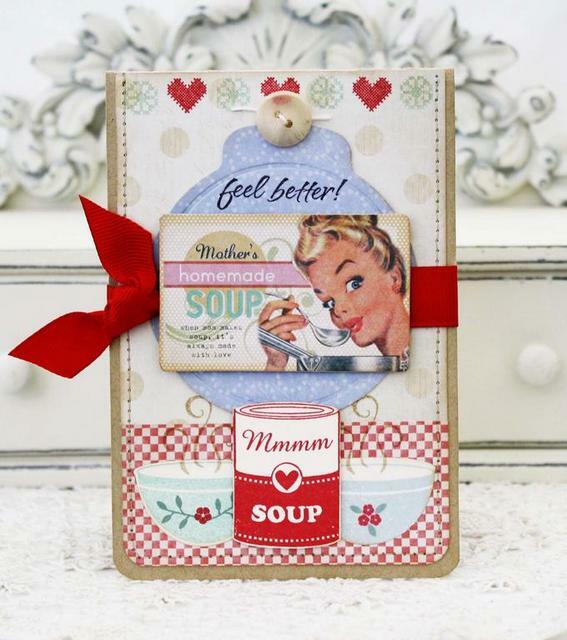 Oh Lordy everything is just fantastic…besides Scrapbooking I enjoy making cards love to decorate wooden door hangers and printer treys for different holidays and occasions…thanks for the chance to win…all of your products are amazing! i love to knit, especially in the evening when i’m watching tv. i enjoy counted cross stitch, although i haven’t made anything in awhile. thanks. I enjoy any kind of crafting. I used to sew all my own clothes, but that has really taken a back seat to everything else lately . I enjoy cross stitch and jewelry making when I get a chance. Sewing flat baby sheets or crocheting flannel baby blankets are what I love to do if I’m not making cards for Operation Write Home. So this month’s release is perfect for me! In addition to cardmaking I love to knit, embroider, and make beaded jewelry. I love crocheting in the winter months and I’m also really big into making me own holiday decore! THanks so much! I started making beads with the PPI dies and paper which led to making bracelets and embellishments. Also I have been using Mod Podge a lot on canvas to collage words, fabrics and images with paint. What fun. I do knit and I used to and appreciate cross stitch. I have tried a lot of things through the years. I knit, crochet, bead, and arrange flowers. I enjoy knitting and crocheting and have recently started dabbling a bit in sewing. The new sets released this month are PERFECT for me to combine all my (current) favorite crafts together. Thanks to the PTI team for another wonderful release! I make soap from scratch. Great inspiration cards today! I cross stitch, but am not very good at it!! Definitely scrapbooking is my priority right now along with cardmaking! I like to make jewelry, wreaths and basically any craft i find on Pinterest! I’m pretty much all about papercrafting. That, and cooking and gardening. I love stamping in all forms, but I also indulge in cooking as a craft and holiday projects to decorate the house. Thank you so much for the chance to win! I love to knit and cook. My whole family has plenty of scarfs to keep them warm all winter! All of this, of course, when I am not playing with my paper crafting stuff! Love the new products! I want to learn to quill. I’ve seen some gorgeous monograms and short words turned into amazing works of art! I’ve also started making more home decor type items, but stamping/coloring with my Copics remains my first love! I’m a knit-wit and I loved this month’s countdown so much! It is awesome I can now stamp labels and cards that show my love of knitting too! I definitely make time for crafting with the kiddos…getting messy together is fun!!! But besides paper crafting I really enjoy counted cross stitch. I was an avid knitter long before I became addicted to papercrafting and stamping. I still knit everyday and love to make socks. This new release for knitting sure fits me to a “T”. I barely have time to stamp these days, but I’ve been thinking about trying knitting. Thanks for the chance to win! I’ll craft nearly anything… if I see something in a store that I think I could make myself, I’ll usually try. Lately, I have been finding ways to combine my stamping supplies with other mediums, like polymer and paper based clays, to create little ornaments and tags. But my number one love is my ink and paper! Cardmaking and scrapbooking take up the better part of my time. Before I got involved in rubber stamping, however, I did a lot of cross stitch. But unfortunately, I don’t have the time for it now. A ton of years ago…macrame,ceramics, sewing, once my daughter came along and was of the age we started ceramics and sewing together great memories. Now we both are avid card makers plus I enjoy some scrapbooking. I guess I would have to say baking goodies for my boys I would consider a second hobby for me. They love them and they disappear before I can blink so it is turning into a full time job. Love all the new goodies. Cannot wait for tonight’s release. Card making is my only craft. Would love to learn how to crochet or knit but haven’t had any luck trying to learn on my own!! I enjoy making time for crocheting, cross-stitch, and home-decor crafts. Thank you so much for the chance to win such a great prize! And Happy Thanksgiving to the entire Papertrey Ink Family! Papercrafting is my favorite. I love making cards and all the supplies that relate to it! But, I have done altered items before, sewing, crocheting and painting. I love all crafts and just being creative in general! I also like making chipboard barn boxes, hand sewing, embroidery is my latest crave and I’ve always loved to draw. My husband tell me that I have too many hobbies. One that I especially enjoy is cutting out wood projects with my scroll saw and then painting them. This time of year is perfect for making Christmas ornaments. Finding time to make cards is hard enough. LOL, but I also love baking, well decorating my baking. And giving them to people to try! Needless to say this is my favorite time of year! Thanks again Papertrey for great products and the chance to win fee stuff! I really devote my time to card making. I like making other types of paper crafts – always want to try a new technique or idea. In the past I used to cross-stitch, sew, scrapbook, paint…I have always enjoyed crafts. But card making is now my one and only. While card making is my first craft of choice, I also quilt. I have also painted, made pottery and even knitted and crocheted, in the past. So to see this months release include sewing, knitting, etc., is awesome!! I enjoy photography and digital scrapbooking. Thanks for a great contest! Lately I’ve sewing and making cute hair accessories for my baby, but I also enjoy crocheting too. I love paper crafting, cards, boxes & bags. I also enjoy making holiday decor and am loving Pinterest and the millions of amazing ideas. Haven’t done any sewing or crocheting for a few years..I’m going to have to get busy. I have been crafting ever since my mom’s friend taught me to needlepoint forty years ago. Over the years, I have enjoyed quilting and sewing, various types of stitchery (I even taught for a few years), soap making, beading, card making, crocheting and knitting. My current passions are knitting and card making, so I am thrilled to see that PTI added a knit-themed collection! My other two favorite crafts are jewelry making and sewing. And, of course, there is never enough time for any of them. Perhaps, a 25 hour day would help! My main crafting now is stamping/cardmaking, but years ago I would cross stitch to keep my hands busy. Have also done some crocheting and knitting but only simple patterns. Never was much of a seamstress but could manage the easier tasks using a sewing machine. Need to get back at that so I could sew on cards. In my much younger days, I was always making felt tree skirts, Christmas ornaments, murals, etc. Lots of handsewing of sequins also. I like to make jewelry, stitch and paint.There are so many things to try but so little time. My kids and I have a box of random “stuff.” Sometimes it’s fun to get it out and see what we can come up with! I just got into sewing. Its something I grew up around but never really put any real interest into. I actually started with a little Singer “Sew Quick” to do small projects and the passion for sewing quickly grew from there!! I love to sew! I’ve made handmade Nativity Sets using a pattern passed down from my grandmother. I’ve made clothes for my son, niece, nephews and friends. I LOVE to sew, so this release has been wonderful for me! I love baking cakes but the only problem is I want to eat them all , so not good for my hips !! I love knitting ~ it is something that I can do while watching my favourite TV series and is so portable ~ a craft to go! I like to knit and crochet in the winter and will occasionally work on several never ending cross stitch projects. In the Winter I love to knit, especially socks! I enjoy lots of different crafts, such as painting, stitching, and altered art but paper crafts are my favorite! Knitting! It’s something I can do to brighten up my long commutes. Now I can make cards to match my gifts this Christmas! Right now I’m mostly doing stamping and paper crafting but I also have some quilting, crocheting and painting projects in the works. I do flower gardening spring through fall. Love this site! So inspiring! I love to make jewelry whenever I am not scrapbooking. Love your release this month! I do enjoy digital scrapbooking as well as card making, but I also love to cook and bake! I love all things paper crafting, but I also like to crochet, make jewelry and I love quilting though I’m just beginning… I am also stepping out into a new direction: I’m taking piano lessons!! Stamping is my first love, but I also like to bake and dabble in photography too. Thanks for all these new exciting products! I enjoy knitting! I can knit while watching TV (although I DID have to stop using metal knitting needles~the sound of the needles made my DH go crazy!) I LOVE the knitting set this month! knitting! which is why this month’s releases are so great! I can hardly wait to get a few of the knitting related sets & make cards & care labels! Thanks so much! Knitting and counted cross-stitch. So looking forward to getting the stamps this time with the knitting design as I have a lot of friends that knit and would love to make them a card. I don’t have time for much other crafting besides card and calendar making. Additionally, I love to read! I love yarn, and so crocheting and knitting are my other hobbies. I love the new knitting images in this release. Scrapbooking and photography are some other crafts I like to do, but the one thing I love that I wish I had more time for is working on my stained glass projects. I went and bought some beads one day thinking I would add them to cards or something like that but I ended up making some bracelets and earrings. I found that jewelry making is very fun! Especially since my daughter enjoys it too. I like to draw and paint in my journals. What a fantastic release this month is… so different and so sweet! hugs. AMAZING release!!! I would say the crafting I spend the most time doing outside of my own papercrafting, is crafting with my kids! I also enjoy crocheting – but don’t find near enough time in the day to do it! My free time usually goes to cardmaking but when I cannot be in my craft room and I have time to craft (in the car, out of the house) I do felt embroidery. My mother-in-law makes gorgeous embroidered felt stockings and I fell in love with them. I hope to get good enough to make things that can be heirlooms to my children too. This implies that I can fit in even the card making. But I also love to sketch and draw, scrapbook and do digital crafts. Love this months sets/dies. Can’t wait to get my hands on some of these things. I like to work with fall colored silk flowers, straw bales and scarecrows. My second favorite hobby is scrapbooking. Its gratifying to know I am making a memory album for my grandchildren that will someday be shared with their own children. I knit…and specifically Prayer Shawls…there is always someone in need of those! And I help my grand daughter sew pillow cases and bags! I also do counted cross stich and some knitting and crochet but spend far more time making cards and other stamped 3-D items for local crafts shows. I love making all crafts. I love using paper art to decorate other items for my home. I’ve dabbled in lots of things, but card making is my love! I also enjoy crocheting during the cold months and making jewelry with my daughter. I enjoy needlepoint, cross stitch, sketching and painting with watercolors… especially when I travel. Paper crafting supplies just don’t fit in a tote bag! Oh my goodness – just about ANY crafts! 🙂 I’d have to say crocheting/knitting and making jewelry are just after papercrafting though. paper crafting and rubber stamping are my first loves, but I recently learned to knit and really enjoy that too. Yes, I’ll be buying those knitting stamps! I’ve tried just about every craft, but my all time favorites are making cards, scrapbooks and soap! I started out as a weaver and had a huge floor loom that I loved. I did a bit of tole painting, crewel work, ceramics, sewed since I was 13 and made tons of clothes for my girls while they were growing up. Did a little knitting, crocheting as well. Now I love card making, paper crafting, repurposing items for home use, and just being creative. I don’t really have any extra time, but I used to cross stitch all the time. My first love is scrapbooking but I also love making wreaths- choosing different themes and color combinations based on the seasons or the holiday. Have done a number of crafts in the past – sewing, painting, pottery, Christmas ornaments – but paper is what I always come back to. I would like to do watercolors…someday! I LOVE counted criss-stitch. My eyes aren’t what they used to be but I can compensatewith larger countt fabric. I’ve been a stitcher for almost 40 yr! Stamping is my biggest hobby, but I want to learn to Crochet and Knit. I have wanted to learn for a long time, and the release has pushed me over the edge! Beading! I used to bead a lot but had not beading for quite some time. Really need to pick it up again. I love papercraft so much I don’t have time for other crafts. I used to tolepaint and crochet. I love to quilt, crochet, and make jewelry. I love to work with a lot of color! Making cards is my passion but when I have extra time, I love to make jewelries when I get the chance! My main craft is card making, especially with stamps and die cuts. Besides I love blogging, but it probably doesn’t count as craft 😉 So my other craft hobby is making boxes and cases out of paper. I like to embroider by machine and spend most of the time digitzing designs and giving classes for the software. 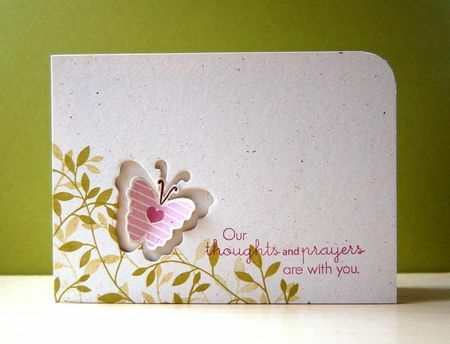 Stamping and papercrafting is the relaxing complement – and much quieter than a runnign embroidery machine! Your beautiful designs and dies make me want to spend more and more time papercrafting…. Scrapbooking. I used to be a very avid knitter, but unfortunately carpal tunnel and I are now friends…. Great products this month, as always! I love to cross-stitch and I recently got hooked on zentangling which is doodling with a purpose. It’s almost as much fun as stamping and coloring! I also really like to make jewelry and sew little dolls. I like to make Christmas Wreaths. Last year I made eight wreaths for my family. Each one has fits their personality. I made one with angels for my aunt, snowmen for my brother, crystals for my sister, santa clauses for my other brother, red pointsettas for my uncle, and so on. I also make them for my friends. I do the colors and themes they ask for. I really enjoy it. I don’t really do any other crafts…but every now and then I am inspired to pull out my yarn and crochet a hat or a scarf. But that inspiration comes only during the winter and only on a rare moment of desperation! LOL! I make jewelry,there is cross over between the cards with using up some leftover papers. I also love to cross stitch samplers, just got back into last year (wasn’t sure I could still see to work on linen),I like to do this during the winter months. Card making is still my first choice. Besides stamping for cards and scrapbooks, I also love to quilt, crochet and cross-stitch. I come from a long line of crafty women! I also knit, crochet, and cross-stitch! Since I do papercrafting at my desk in my studio, I like to do the other needlework activities while watching TV in the livingroom with my hubby! I enjoy taking time to knit or counted cross stitch. Knitting, sewing, painting, scrapbooking… name it and I’ve probably tried it. I love to make altered canvas as decoration, i have made several as gifts. Thanks for the chance to win! Wonderful hop and release. Always glad to see homemade crafts reflected in this hobby of mine. I knit, crochet, embroider, etc., thanks to my wonderful Mom. I love to stamp and make cards mostly. Next I love to scrapbook… any thing else I just don’t get the time for, but I wish I did. I love learning new crafty things! Well, I wouldn’t really call cooking a craft, but that is my next favorite hobby. I love to try new recipes! I used to be a cross-stitcher, but once I had children I didn’t really have time for stamping and sewing, so the sewing has been set aside for a few years. My main hobby is cardmaking. As we head into the winter months, I will crochet and have a few projects in mind that I look forward to starting. I knit. I have knitted for over 30 years. When we lived in a colder climate, I would knit all the kids sweaters, cardigans etc. every year. Now, as we live in a hotter climate, I’m relegated to socks and shawls, but still enjoy knitting and knit most of my Christmas presents. I have a long list of requests from friends and family. However, this year, I can make cute tags to go along with my goodies. I enjoy creating random holiday crafts…for instance this coming Christmas holiday I have been making ribbon wreaths. Or I just like to try my hand at re-creating various crafts/gifts I see on Pinterest. I love all crafts and am always intrigued by something new and unique or a different twist on an old standard. Paper crafting is my favorite, but I also enjoy knitting, quilting and jewelry making. Tole painting. I sell my things at local bazaars. I’ve recently added the paper crafts and LOVE them both! Crocheting is something I love to do when I have time. And I’ve been working on a cross stitch project for years (I will refrain from telling you how many years!!). I only work on it when I’m not into a card making project, which is not too often. Other than making cards, the only other crafting I do is occasional scrapbooking. Once I discovered cardmaking…everything else fell by the wayside. Crafting of all kinds! I just taught myself to knit so that is my current fav, but I also love cross stitching, quilting, sewing, crocheting, and OF COURSE paper crafting! I love all crafts! I have been into knitting lately as I am making a baby blanket for a friend who is pregnant. I love to try new crafty things so am always on the lookout for something cute to do. I like to sew. ( make things for the house) I enjoy making card the most! Thanks for a chance to win! I enjoy photography as well as card making and scrapbooking. I enjoy doing several things. I like to sew and in addition to learning how to make cards, I am learning tole painting. My mom started teaching me to bake when I was 8 years old. I now have grown children and baking is still my favorite hobby! I was a knitter long before papercrafting took over most of my creative energy – I love love soft cottons & silks! Papercrafting of any sort is my favorite.. but I do enjoy jewelry making, my girly and I are making soap this week! 🙂 and SHOPPING for supplies of said crafts.. even crafts I dont do..and wish I did.. how CRAZY is that!! HA HA!! 🙂 ANOTHER great release cant wait to SHOP!! I love scrapbooking & cardmaking but I also love redoing/painting old furniture for a new look! Holiday craftmaking is also on my list of fun things to do! I enjoy crocheting and hope to do more of it. But card making is my favorite. When I was in my late teens I used to knit and used to make a sweater a month. I haven’t done a whole lot of that lately, but recently I knitted a scarf for my husband and sure enjoyed the process and need to do more of it! I also like to scrapbook, make party favors and gifts and have done some sewing and cross stitching. I am always looking for a fun new project to make. I want to learn to quilt someday. Gosh, I love ALL things crafty. Sewing, knitting, crochet, cross stitch, scrapbooking, and even some jewelry making. Great things to explore and share with my children. Even tried flower arranging – yeah – allergies made that a challenge, ha! Fabulous release! I enjoy making stained glass projects. At the moment any extra time crafting is spent trying to catch up with my Project Life…. always so happy to finish another week!!! I love sewing, knitting and crocheting as well as making cards!!! Jewelry making; love to be able to combine the cards with the gifts. Wish I had time for more!! Besides stamping and cardmaking I love painting!!! I’m creating children’s canvases…. Along with paper crafting, I enjoy jewelry making, sewing, and crocheting. I have dabbled in all sorts of crafts and would say I enjoy those the most. I enjoy sewing dolls and small gifts for friends and family, so this months release is a welcome surprise. Maybe I’ll be able to incoporate some of the stamps to create my own fabric and make some coordinating gift tags. I mostly spend my ‘craft time’ making cards, but I also enjoy cross stitch and crochet. I love making holiday home decor projects! windows and put in mirrors instead of the glass. Sometimes I will stencil on the window if there is enough room. Love my quilling. I am also getting back into my beading. I definitely want to incorporate these into my card designing. Paper crafting is my first love, but I also love working with fiber. For many years I had a floor loom and enjoyed weaving. I sew, knit, needlepoint, needle punch, felting, and when possible combine my fiber art with my paper crafting. I also enjoy cooking, especially around the holidays and share it with my family. I have been toying with the idea of taking up sewing. I took Home Ec when I was in high school and used to make my own skirts etc. With the price and quality of clothing these days, I have been thinking of restyling / updating some of my classic wellmade pieces. We shall see! I’m not very good at it, but I like to sew! I love to bake and decorate cakes. Whenever I have the chance to bring something to a potluck, I whip up some frosting and dazzle up a baked good. 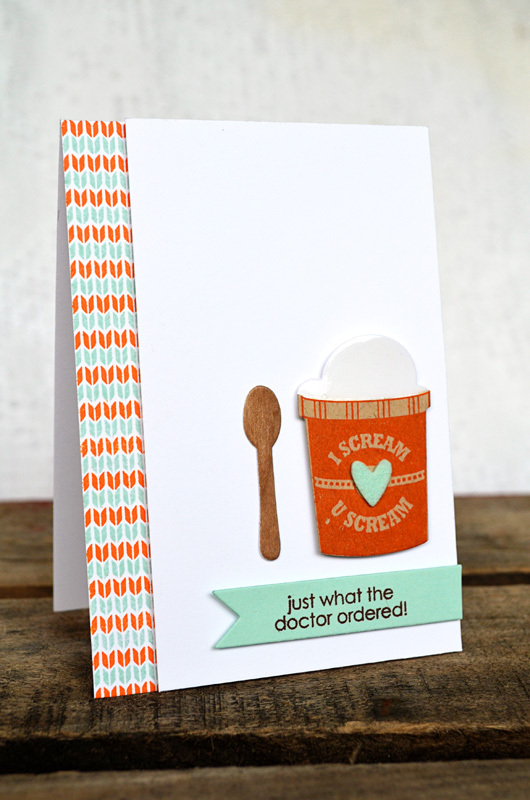 Card making is my 1st love, but I have fun scrapbooking as well, and – while not a paper craft – I LOVE baking! I love to cook for my family and try different recipes, I also have been known to make jewelry on occasion. With my life being so busy with my 4 year old triplets I don’t find much time to craft. Maybe when they start school heehee. Quilting and knitting are my other two passions. I’m so glad I don’t have to choose just ONE! Besides card making, I also love mixed media art and baking! I love to cross stitch, but papercrafting is my all-time favorite hobby! I have also been doing a little mixed-media and making some jewelry (the paper beads papers have come in handy for this!). I also love to crochet, make jewelry, sew, and bake! Sewing is my first love but it takes more time. I love paper crafting because I can fit it in to my busy life. I love to crochet but haven’t had time to do it in a while. My young did recently suggested that I take up another hobby and my dh nearly exploded…. my other main habits are textile based – I embroider, sew and quilt, but I’ve dabbled in a lot! Mine is a kitchen craft as I love to bake, especially cakes & cupcakes. I’m hoping to make some mini Christmas cakes soon. I enjoy it all!, especially sewing, knitting, and creating handmade items for my granddaughters. Like many others I’m learning to knit. I occasionally scrapbook and am also interested in photography. If only there were more hours in a day! I love to bead and also to cross stitch! Quilting is my other craft of choice when I have the chance; however, card making is what I love to do most!! Always ready to try new crafts too just to change things up a bit. Although scrapbooking is my main hobby and crafty outlet, I do also like to bead. I have made earrings and necklaces for myself and friends. I don’t get to it as often as I like, especially with scrapbooking and card making calling my name so often (! ), but I always love when I get the chance to pull out my multi-coloured beads and wires and fashion something fun to wear! Well considering I am known as “Martha” in my family, I have a lot of crafty hobbies! I make all our soap, I knit and crochet, I sew, I do hand and machine embroidery and cross stitch. I used to make jewelry too but when we moved to a smaller place I had to pear down a bit so all that went to my sister. Thank you so much for the chance to win! In addition to cardmaking and scrapbooking, I love photography and just making crafty things in general! I do cross stitch (the new set is just up my alley) and needlepoint but stamping and making cards is my favorite crafty thing to do. I just recently started sewing and love to use my dies to cut fabric and felt to add embellishments to my projects. I love to knit & crochet! So this release is awesome to me! So cool! Stamping has become my main hobby, but I still have grand intentions of getting back into counted cross stitch. I have all the floss, yards of 32-count linen, and drawers of charts. The only thing lacking is time…thanks for the chance to win this great gift certificate, and thanks for the inspiration! I love to scrapbook in addition to making cards. I’ve just started learning to sew. I’m starting my first rag quilt for a friend that is having a baby in April! I also enjoy spending time sewing & jewelry making. Love theses new releases! My other craft loves are cross-stitching and jewelry making. With this release it will fun to combine them! Stamping and card making is always first on my list, but love to sketch in watercolor’s as well. To think my mother wouldn’t let me take home economics in high school. Little did she know, I just needed time to grow into the creative gene. I love to do anything that stretches the imagination and will support anyone else does the same! Keep up the good work everyone! Scrapbooking would be right next to card making but I really enjoy all crafts – mostly paper crafts but anything will do! I enjoy doing most crafts. From sewing to jewelry making to scrapbooking and card making. Anything creative really. I love to sew. It all started because I wanted to sew or stitch on paper-crafted cards/ scrapbook pages that I was making. I discovered that I really love to sew. Besides cardmaking and scrapbooking, I really enjoy sewing. i have made various things over the years. I enjoy photography and scrapbooking, as well as sewing. My crafts are cards, scrapbooking and 3d papercrafts, but I like to try new cooking/baking recipes. I was an avid counted cross-stitch crafter. I liked the clean look. I mostly enjoy papercrafting in some way. Cards, scrapbooking, altered items. I used to paint with oils when I was a child. I would really like to get back into that someday. Then I’d really need a studio! Imagine two Boston terriers getting into that mess. I also love to cross stitch and sewing home decor projects are a favorite too. I just started knitting and am enjoying that. Your new release is a perfect pairing with my other hobbies. Your team’s creative ideas are my inspiration! I also enjoy loom knitting. It’s so cozy when the afghan you’re making is long enough to snuggle under! I like to crochet during the cold months. It keeps me warm and everyone enjoys their scarves! Card making is my favorite but I also love drawing (pen/ink, markers, and colored pencils), painting (face painting that is! http://www.thepaintprincess.com), graphic design (obsessed with fonts, love this for mass production), and refurbishing furniture/diy home improvement. I’m always taking on some type of project with my mom. I also love kid crafts and coming up with cute projects/stealing stuff off pinterest. I’ll pretty much try anything crafty. I want to learn to sew and knit. That’s next on my list! I scrapbook, knit, crochet and cook. I love made gifts for all my family and friends. I am a cardmaker but would like to sew small art quilts. I’ve had my sewing machine for quite a while but haven’t used it yet. Ahhh…my other favourite crafting hobby is definitely quilting. Sadly, there are just not enough hours in the day. The last quilt I made was about two years ago for my niece. It was an applique quilt using images enlarged from some of my favourite stamps! I love counted cross stitch and used to enjoy it more often until this thing called card making and scrapbooking came into my life ! Making jewelry is my other craft besides cards. Scrapbooking! I like making yo-yo’s on road trips. I attempting to master crochet. Thanks for the chance! I’ve recently gotten into the digital side. I’m really enjoying making anything for parties. Invitations, cupcake toppers, food tents, water bottle wraps, anything to bring a party together with the theme. Card making really takes up the crafty space in my head, but I have been known to crochet and cross stitch. I love to needlepoint. I get up early to have my coffee and needlepoint. It’s how I start my day! That is, unless it’s countdown time. Then I check PTI out instead! Painting on wine glasses—a new hobby ! I also love to bake. Is that a craft? I am still looking for the perfect sugar cookie and icing recipe so I can make beautiful cookies like I see all over Pinterest! Great release. I love to sew and knit . Lately paper crafting has been at the top of my list. So I love to see all of your great ideas. I love to scrapbook, knit, crochet, cross stitch, and cook for my family. I love this new release and it makes me think of home and family! I like to do cross-stitch embroidery or embroidery with beads – it’s a good craft to do when watching TV or to take on holiday (much more portable to take a stitching project than trying to decide what papers, inks & stamps to take away with you!). I love to scrapbook family photos, but my favorite “other” craft is quilting. I love to crochet and do it in between making cards and paper crafts! I really enjoy sewing all sorts of items from clothing to home dec and quilting :). I love to bake. Other than that, whatever crafts my kids need or want me to help with – making Halloween costumes, dioramas, friendship bracelets, etc. That’s enough to keep me busy! Card making and scrapbooking are my main crafts but I also find a bit of time to dabble in mosaics, quilting and cross stitch. when I am not stamping, I love to sew for my grand children. I’m enjoying crocheting at the moment, especially little flowers! I really love doing anything creative, I paint watercolors,embriodry,sewing,jewelry making,scrapbooking,photography. Being creative keeps me sane. Scrapbooking is my other favorite craft. 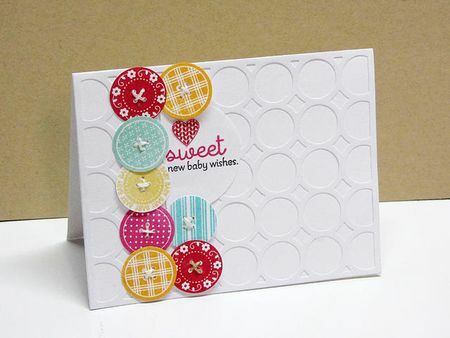 I love that many of my card making items can be used for scrapbooking as well. Scrapbooking is my other favorite craft. I love that all my supplies can be used on both card making and scrapbooking. I love to crochet, and I love to cross stitch. 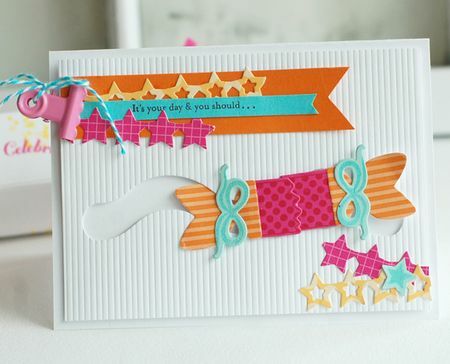 Making cards and tags are on the top of my list! Stamping is my crafting love. That’s about all I have time for but I use to scrapbook and do counted cross stitch. I love to knit. I am currently making a cardigan, I knit on the weekends when we are away from home. it’s easy to take with on long car trips and easy to put down when I need to. It is a great hobby and I love it just as much as I do paper crafting. And I love love the new knitting stamps this release! Super excited for them! Thanks so much!!! Most of the time I make cards but I also like to scrapbook. I always have a bag of yarn with my crochet hooks within reach – just finished a poncho for my 10mo. I also just opened my Project Life kit (purchased LAST Dec!) and trying to jumpstart my scrapbooking. Is it bad that it took my 2hrs to finish one page?? D’OH!